Train the Wright way with Coach Wright! Apply for your FREE Body Transformation Assessment! Apply for my FREE Assessment with Coach Wright! TRAIN - THE WRIGHT WAY. Welcome to Simply Wright Fitness! It's Time To Achieve Your Health & Fitness Goals The Wright Way. ​Coach Wright does one simple thing differently in Group Personal Training than your typical exercise instructor - he coaches. That's the simple yet major difference that many students are seeking to get their desired results! As opposed to a group exercise class - where you have a choreographed dance setting and no individual attention, Coach Wright offers Group Personal Training sessions that allow small groups of people doing different exercises together at their own rate of speed, ability, and intensity all while providing a customized personal approach to each member. Is Group Personal Training right for me? 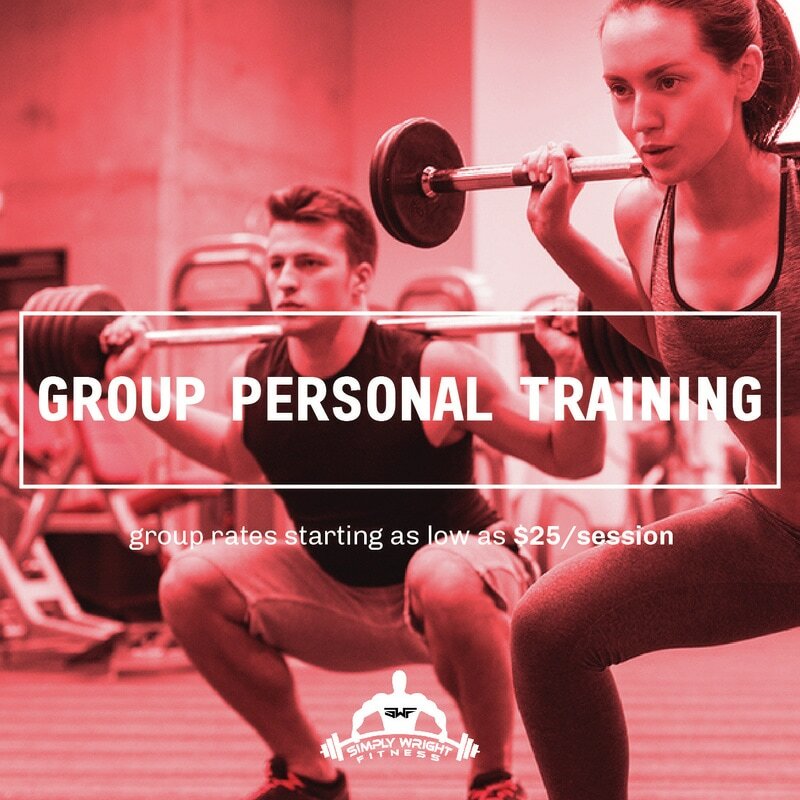 ​In addition to the cost savings you'll receive, with Group Personal Training you get the added benefit of encouragement and motivation from both your peers and Coach Wright! Group Personal Training sessions are generally more exciting because of the high energy and team synergy surging throughout the group. It's also not rare to see an increased level of competition due to the engaging atmosphere. 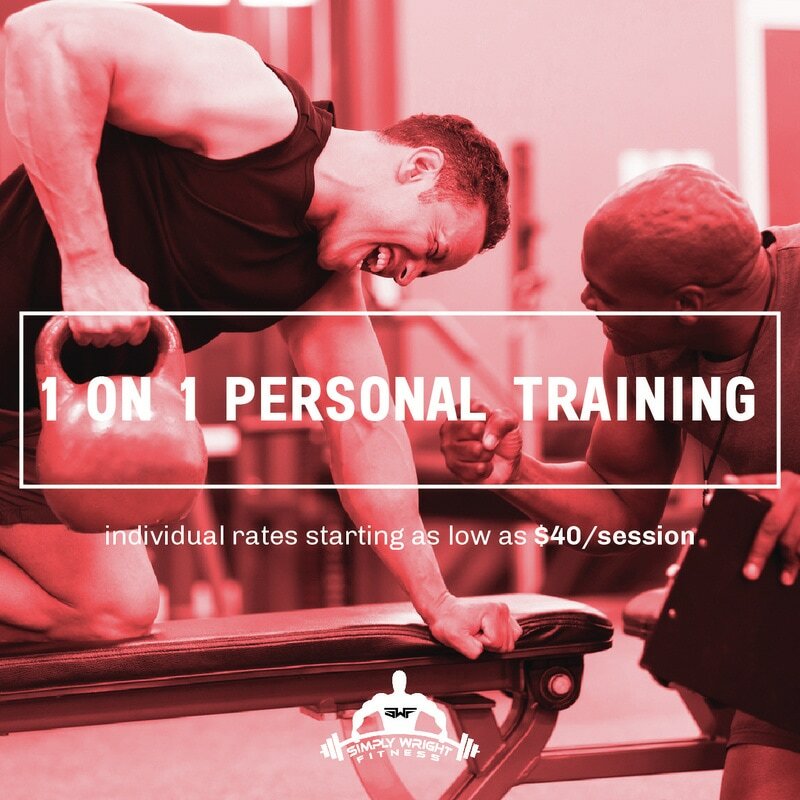 Ultimately, if you're looking for an intense customized workout, in search of team motivation to get in shape, or simply wanting to get fit in a fun environment, then Group Personal Training with Coach Wright is Simply Wright for you! I'm ready Coach Wright! Let's get started. I need a great Personal Trainer. ​​​Hiring a personal trainer is a priceless resource in reaching your fitness goals. Having your very own personal trainer that understands the science of exercise and fitness is an investment that will pay huge dividends to your health, confidence, and overall well-being. 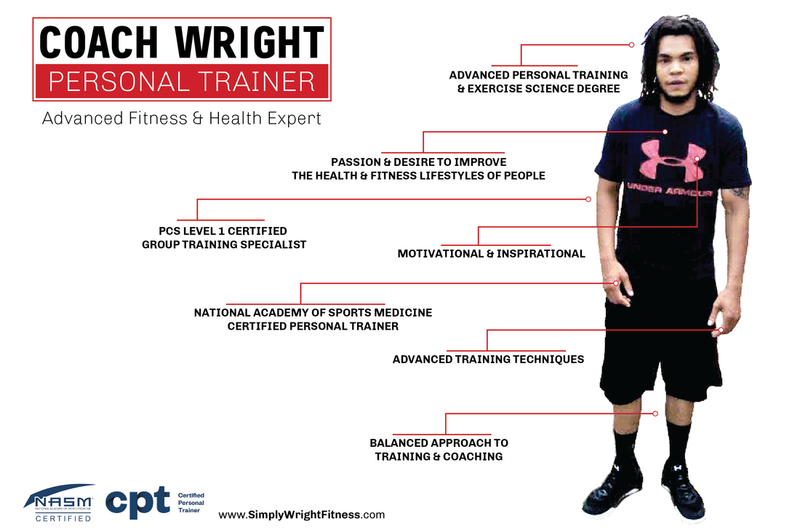 Great personal trainers not only provide customized workout programs designed specifically for their client's goals but they also contribute an overwhelming amount of support and professionalism into their programs - here at Simply Wright Fitness, Coach Wright delivers this and more! Will you help me reach my goals? ​Accomplishing your goals is our top priority behind safety. Your safety always comes first at Simply Wright Fitness. If you are tired of not seeing results or bored with the same day-to-day routines that aren't allowing you to reach your goals then Simply Wright Fitness and Coach Wright is definitely your solution to a better fit and healthier lifestyle. All we ask is that you be committed. If you are willing to commit to transforming your fitness and health lifestyle we will ensure you with the best 1-on-1 Personal Training programs designed specifically to reach your goals with maximum results! I'm ready to start training with you Coach Wright! WHY PEOPLE CHOOSE SIMPLY WRIGHT FITNESS. Coach Wright prides himself on providing professional coaching in a professional environment. The unmatched value of Coach Wright’s personal training expertise is through the roof, but his affordable pricing is not. Every single client has different needs and Coach Wright is dedicated to providing coaching targeted to your goals.